The Santa Fe Trail runs from Palmer Lake on the north to Fountain area on the south. 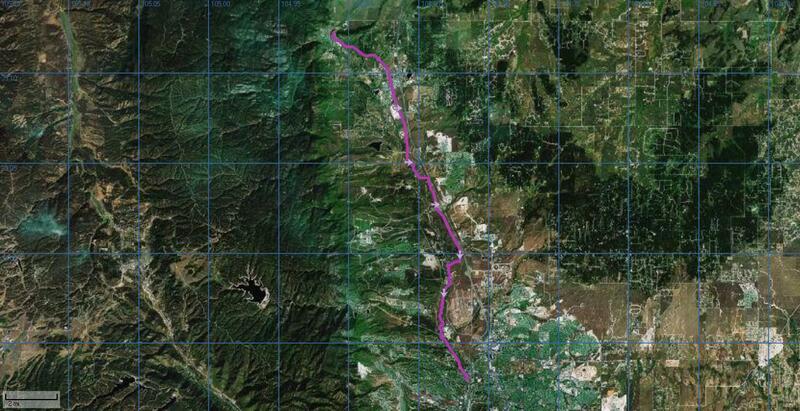 It is part of the Front Range trail system and this section will cover the trail from Palmer Lake to Woodmen Rd. About 1/2 mile north of Woodmen Rd, the trail becomes the Greenway Trail and some of the Greenway Trail sections will be mapped in their own page. It is known as the Greenway Trail in the Colorado Springs city limits. There are several distinct segments to the SF Trail on the north end so you can easily break up the trail into smaller sections for easier hikes, runs or rides. The trail is surfaced with a crushed rock material and suitable for multiple uses. It is also fairly wide along most of its course. For this page, I will describe the trail from Palmer Lake to Woodmen Road with subheading for each major section. 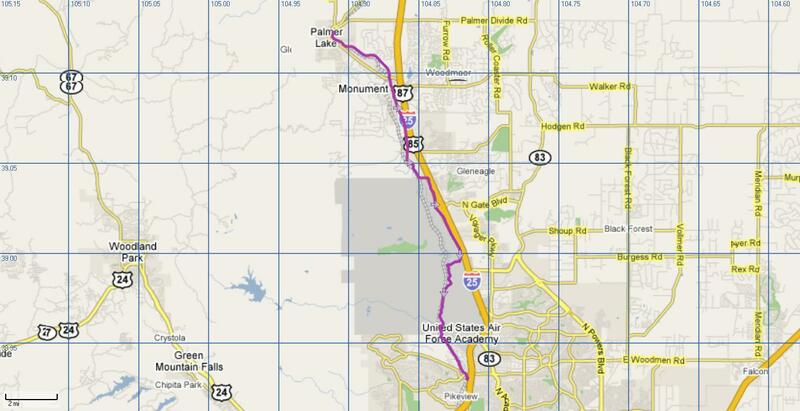 To get to the Palmer Lake Trail head, you would drive north from Colorado Springs on I-25 to County Line Road (exit 163). Turn west and go for 2.5 miles and just before the railroad crossing, on the left, is the access to the parking lot and trail head. Water and facilities are available at the trailhead during summer months. Watch the forum for information about its availability. 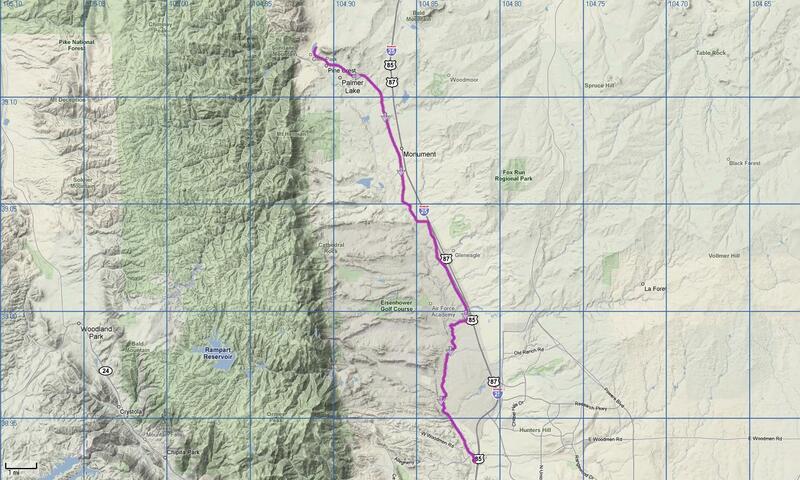 The trail starts at a trail head on the east side of the lake in Palmer lake and it is about 17 miles to Woodmen Rd. There are trail markers at 1 mile intervals along the trail. In the 2008, the county trail people started changeing the mile markers. The old markers which are green colored Fiberglass stakes are being replaced with more permanent concrete markers. Palmer Lake was the beginning point for markers for the old system but now the beginning point marker is on the south end of the SF Trail trail and Palmer Lake is the end point for the markers. Currently, the markers stop at a point across from the treatment plant between Baptist Road and Northgate Road. This means that you have to know where the old markers were south of this point. The first section of the course follow the old railway right of way to Monument starting at the Park in Palmer Lake at County Line Rd and Hwy 105. The trail gradually decends along this section for most of the 3.5 miles with just one short uphill after crossing under Hwy 105. It is not too obvious but your legs will tell you there is a difference depending on the direction. The trail parallels the railroad tracks. There is a good view of Elephant Rock and the surrounding rock formations to the Northeast at about 1-2 miles. As you approach Monument, you will cross under highway 105 and approach the Monument trailhead. There is a trailhead and parking in Monument and water/facilities but only during the summer. At 3.0 there is a small parking area along highway 105 but no facilities. Since this section still has the old markers, they are measured from Palmer Lake. Mile marker 1 and 2 are near seating area so if you miss them, you can take the seats as good approximates. Mile marker 3 is about 1/4 mile before the trail drops down to go under Hwy 105. From the Monument trailhead, the trail proceeds south on a relatively flat and straight for 2.75 miles. This section is mostly straight and a slight downhill grade. It is wide open without and trees and if it is windy, there is nothing to stop the wind and also no shade. About 1.5 along the trail (5 mile mark) is a open shelter that could provide some protection from rain, hail, and lightning. I-25 parallels the trail to the east and the old Denver Hwy to the west. At Baptist Road is parking and facilities. Water and restrooms are available only from May to the end of September and with the current budget crisis in the County, that can be iffy. If you want to start at the Monument trailhead, take I-25 North to the Monument exit (exit 161). Head west on 105 and after crossing the Highway, 105 will turn right. Follow 105 for 1 block to 3rd St and turn left (west) and go for about 1/2 mile. The trail head will be on the left just before the pedestrian crossing signal. 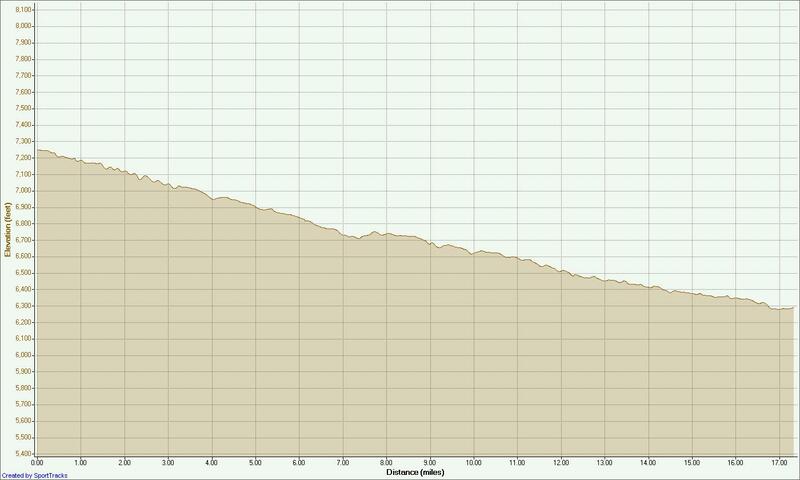 After Leaving Baptist Road, the trail begins to get more hilly. The trail is still heading down but there are a few gradual climbs and decents between here and Northgate Road. The terrain is still fairly open with no real shelter except for another of those open shelters at about 2 miles from the trailhead. The first mile or so is home to a large colony of prairie dogs who will whistle at you as you pass. This section of the trail ends at a concrete bridge crossing Northgate road and entrance to the AFA. The trailhead is about 1/4 mile down the trail that heads west from the start of the bridge. There is parking here but no facilities. This trailhead gets quite crowded on weekends and parking can be difficult to find. To get to the Baptist Road Trailhead, take I-25 North to the Baptist Road exit (exit 158). Head west on Baptist Road to the Old Dever Hwy, turn right and then another immediate right into the parking lot. Seasonal water and facilities are available here but again, it may be spotty with the current budget crisis. This is the last point for water and facilities going south when it is working. The last section is a long one. This crosses the Air Force Academy and this means that it has no easy access to points on the trail. If entrance to the Academy is not restricted, there is a trailhead with parking at Ice Lake which is about 6 miles from Northgate. There is no water but there is a porta-potty available. It sometimes lacks paper though. There is also a small wooden structure, I think for horses that can server as a shelter if needed. This last section has more varied terrain than previous sections. It starts out fairly flat for about 2 1/2 miles then turns west and descends for about 3/4 mile. From here to the end, it is a series of short ups and downs with 3 slightly longer ups. The 17 mile point is about where the trail turns to go under Woodmen Road. If you park at the official trail head, this is the place. I generally park at the park and ride a little further down tail because it has more space. This will add about .4 mile to the course. To get to the Northgate Trailhead, take I-25 North to the Northgate Road (north entrance to the AFA) exit heading west (exit 156). Head west to just before the entrance gate to the AFA. A parking lot will be on the right side of the road. This is the trail head. To get to the trail, follow the access trail at the north end of the lot for about 1/3 mile. There is no facilities here. In summary, this trail between Palmer Lake is quite popular. A lot of bikers will use all or parts of the trail and near the various access points, there are numerous hikers. For running, you can start at any of the access points and run out and back. I like to leave a car at Woodmen and drive another up to one of the access points depending on distance and running one way.